There are several ways to get to Lefkada Island, but the usual ways are or by plane, or by Ferry.There are may charter airlines which fly into Preveza every summer from U.K., Germany, Holland, Czech Republic, Austria, Switzerland, Sweden and Denmark, with several other airlines also considering Preveza as a destination. Some of the advantages of flying into Preveza are: a brand new airport building – efficient with plenty of car parking, it has a long runway, it is close to Lefkada island (only 15 minutes drive) with a good road, an efficient road connection to the major ports of Igoumenitsa and Patras. There is a significant reduction of time to Igoumenitsa Port because of a new tunnel that connects Aktio with Preveza. Also there is now a bridge close to Patras which connects mainland with Peloponnese. The closest International Ports are Igoumenitsa and Patras. The most convinience port for lefkas is Igoumenitsa.Every day a large number of large and luxurius ferry boats depart from Italy (Bari, Brindisi, Ancona, Venice) to Greece (Igoumenitsa, Partas).Many tourists use these ferries to reach Greece by car travelling through Europe. Igoumentitsa in the west of Greece is the most popular arrival point for people who will visit Lefkada as it is only a short drive (less than 2 hours ), between Igoumenitsa and Lefkada Town. The main ferry companies depart from the ports of Ancona and Venice in the northeast coast of Italy and Brindisi or Bari in the southeast coast of Italy. Ancona and Venice are the most popular crossings with the best ferry boats. These are newly built ferry boats with full comforts and all modern facilities such as air conditioning, comfortable lobbies, restaurants, pools, shops, video games, casinos, movie theatre etc. The shorter crossings from Brindisi and Bari have smaller ferries and basic facilities on board. If you need information or if you would like to make a booking, contact us and we can help to make your travel arrangements run smoothly. Lefkada is a surprise – a wonderful one – for not only is it outstandingly beautiful but also amazingly untouched. Off the main shipping routes, it’s mountainous landscape was a lure for conquerors in times gone by. Lefkada has been kept off the well known tourist track, maybe because it is joined to the mainland by a floating bridge, which moves to allow boats through for ten minutes, every hour. The beaches are superb, the rugged landscape is a delight and the island is a paradise for the adventurous as well as beach-lovers. It’s crystal clear sea, gentle tides and currents, and temperamental winds draw sports enthusiasts to it’s shores year after year. Cycling, Scuba, Windsurfing, Sailing and many other sports are practiced here with varying amounts of energy and enthusiasm. The wind in Vassiliki, which makes the resort so famous for windsurfing, arrives exactly when needed in the afternoon, to cool you down from the midday heat. The scenery changes dramatically as you move from the east to west side of the island. On the east coast you will find dense vegetation and small rocky coves. All along the west coast you can see high cliffs, with steep drops to endless sandy beaches. The capital of the island, Lefkada, is a beautiful town with a wide selection of shops, restaurants, bars, cafes and lots of nightlife. Here you will find many small streets to explore and interesting museums to visit. Other interesting places on the island include the busy resort of Nidri, the village of Poros with the pebbled beach of Mikro Yialo, Sivota and Agios Nikitas, traditional fishing villages, Karia, a beautiful mountain village which is famous for it’s embroidery and Vassiliki, where our office is situated, is a lovely little village situated around a harbour and famous for it’s watersports. Also of remarkable beauty are the mountan villages of Athani, Episkopou, Kalamitsi. By boat you can explore the small island of Meganissi and have a view of the famous island of Skorpios, belonging to the Onassis family. Also within easy reach are the Islands of Kefalonia and Ithaka. 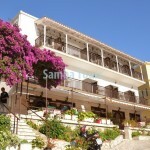 Lefkada will impress anyone with its wild and natural beauty, picturesque villages, sandy beaches and stunning scenary. Lefkada is an amazing combination of green mountains and white sandy beaches and it is one of the most beautiful islands in Greece with some of the best beaches in the world. Vassiliki is a picturesque fishing village situated around a little harbour and surrounded by dense vegetation. 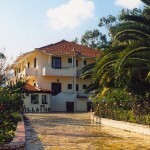 It is 38 kilometres south of the capital of Lefkada Town and has a population of aprox. 400 inhabitants. Vasiliki is fairly quiet at the start and end of the summer season, but really comes to life in July and August when it is recognised as one of the windsurfing capitals of Europe. The bay is wide and sheltered and ideal not only for windsurfing, but also for sunworshippers who enjoy the spectacular sight on a windy day, of hundreds of windsurfers speeding across the water. It is a traditional Greek resort with the main pebble/sandy beach stretching as far as Ponti village. It also has many other smaller coves dotted along the coast which attract many people who enjoy swimming in the crystal clear water. Sunbeds and umbrellas can be hired on the main beach and various watersports are available along the beach, as well as laser sailboats and catamarans which are available for rent. In this area, you can find a wide choice of accommodation as well as many tavernas, shops, cafes and bars which are situated around the busy little harbour. Some of the hotels and apartments are located on the beach offering special facilities for storing windsurfing equipment. Accommodation can be difficult to find during the middle of the summer due to the popularity of this resort, it is best to book in advance. There are cash dispensing machines (ATM) which can be temperamental , so it is best to have some money or travellers cheques just in case you need to change them in Samba Tours, our office, which is open everyday during the summer. During the summer season, a selection of supermarkets are open all day from early morning until about midnight. There is a health centre, with qualified Doctors which is open 24 hours, 7 days a week and one Pharmacy. A Post Office is open weekday mornings. You will find a selection of day trips by boat leaving from Vassiliki which allow you to visit the neighbouring islands and various stunning beaches in the area. Southern Lefkada has been inhabitied for thousands of years, with artefacts from the neolithic era (3,500BC) found by Dorpfeld during his excavations near to Evgiros, a small village near to Vassiliki. These artefacts are on exhibit at the Archaeological Museum in Lefkada Town. Vassiliki is a delightful village which attracts many new visitors every year and welcomes many good friends back again and again. Situated on the East Coast of Lefkada, Nidri is the largest tourist resort in Lefkada, attracting thousands of visitors every summer and has a population of about 800 inhabitants in the winter. It is halfway between Lefkada Town (17km north) where the island is connected by floating bridge to the mainland, and Vassiliki (21km south). Nidri has it’s own small ferry port with ferries to Meganissi. 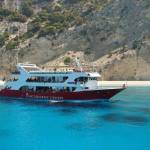 Nidri has quite a good local bus service, which takes you to Lefkas Town and Vassiliki. The immediate area is fairly flat and is good for bicycle rides. Walks through the olive groves to the Nidri Waterfalls (approx. 4km), and around Vlicho Bay to the church of Agia Kiriaki on the headland of Geni opposite Nidri (approx. 8km) are popular. For those with more energy there are walks into the surrounding hills, and in spring the stunning flowers and blossoms and beautiful views over Nidri and the islands just of the east coast are unforgettable. Along with Lefkada Town, Nidri is one of the main yachting destinations in the Ionian Sea. It’s location on the East Coast of Lefkada means that the sea is usually calm, and it is an ideal place to learn to sail. Combined with an interesting coastline full of sheltered and secluded bays and several islands offshore such as Skorpios (the private Onassis Island), there’s plenty to see. All of this can also be enjoyed on one of the local daily boat trips which run throughout the summer – ideal for those who are not sailing around by yacht. It is also possible to rent a small motorboat or dinghy while you are here and explore by yourself. Nidri is also the assembly point for the annual Ionian Regatta – one of the biggest Yachting events in the Mediterranean. Usually held in the third week of September, it typically attracts about 190 entries and is a spectacular sight to watch. There are many daily cruise boats which follow the event, but are popular and best booked in advance. Nidri has a good variety of bars and restaurants to suit all tastes. There are a wide selection of traditional Greek tavernas, as well as restaurants which vary from Chinese and Indian to Italian and International. For a drink you can choose from cafes to music bars, as well as nightclubs open during the summer season so you can enjoy a dance until the early hours. The beaches are gently shelving, of pebble/shingle and sand has been added to some parts of the beach. The water is generally clear, without currents, and warms up quickly during the summer. Sunbeds and umbrellas can be hired on the beach, watersports and motorboat hire are possible and there are plenty of friendly waterside bars and tavernas. There is one bank open in the summer season only, four cash dispensing machines (ATM’s), and several exchange bureaux. During the summer season, dozens of supermarkets are open all day from early morning until about midnight. There are a few pharmacies and one doctors surgery. 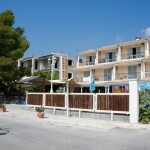 The nearest hospital with emergency medical facilities is in Lefkada Town. A Post Office is open on weekday mornings. A wide variety of accommodation is available, but can be difficult to find during the middle of the summer due to the popularity of this resort. It is best to book in advance.